The chart shows the response in a line chart over the entire batch. It should show you the performance of the internal standard and if you have carry-over in samples such as a Solvent or Double-Blank sample. This is useful in determining the health of the system and variability of the assay over time. To make custom libraries for use in TraceFinder 3.3 Unknown Analysis, the easiest way is to curate your spectra with FreeStyle and send to the NIST 2014 application which comes with the purchase of any NIST 2014 library. To utilize comparative view to its fullest, one must set 3 three properties. Method-Limits-Threshold setting – this setting allows the user to set the height of the horizontal threshold bar in data review. There are two settings. % of Threshold the Sample – dynamic threshold according the peak height of the specified Threshold sample, as described below. Batch view-samples-groups column – this setting assigns samples to groups that are displayed horizontally in the comparative view peaks panel. A unique alpha numeric symbol is used to assign a sample to a group. Each sample with the same symbol is a member of that group. The samples are shown side by side in the peak review panel and are ordered left to right by descending order in the sample grid above. Batch view-threshold samples – the setting allows the user to assign a threshold sample for each group. Any member of the group can be set as the threshold sample. However, only one sample can be utilized at a time in the group. If you want one particular sample to be used as the threshold across the batch make sure it is a member of all the group. For example if you used numbers for the group name and you have 10 groups, the entry for this sample in the groups column would be 1,2,3,4,5,6,7,8,9,10. The settings in the examples above allow for the display shown below. The tall red vertical bar marks the expected retention time and the smaller vertical bars are the edges of the retention time window. Both set in the method parameters for each compound. This allows you to see the drift of chromatography within the sample group. The horizontal red line is the threshold as set in the method as a fixed amount or relative percentage of the threshold sample, as set in the method. A point to note, there were a few instances where everything was setup properly but nothing displayed in the Comparative view. It was found that some older video drivers not comply with technologies Microsoft used to render the images in this complex grid. However, the issue was fixed in all cases by updating to the latest video drivers for the PC. 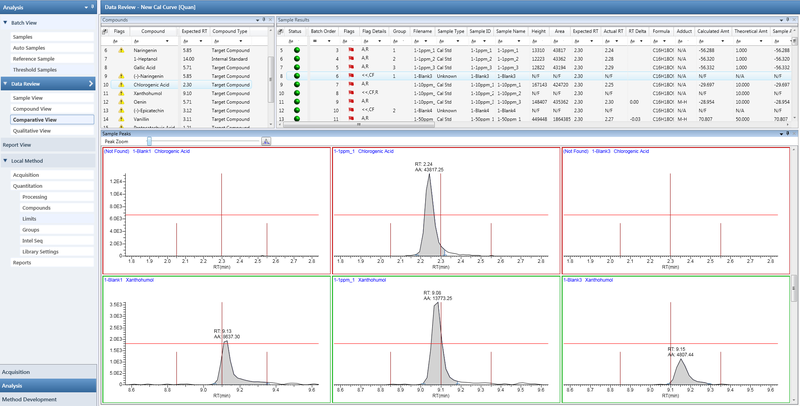 TraceFinder has 4 functions for ion range calculations. 1) Manual – This functions as the name implies, it allows the user to define a targeted ratio by manually entering it in the ratios section of the detection tab of the confirming ions of a compound. 2) Average – This functions allows the data to drive the targeted ratio of each confirming peak by averaging the detected peaks for each confirming ion in each component from the calibration curve and applying the average as the target ratio. This is useful in many clinical experiments where response may be variable across sample sets. 3) Weighted Average – Performs the same function as Average with the exception that it weights the bottom end of the curve in the calculation of the target amount. This is useful in assays where the expected amounts in the unknown sample types are typically on the lower end of the calibration range. 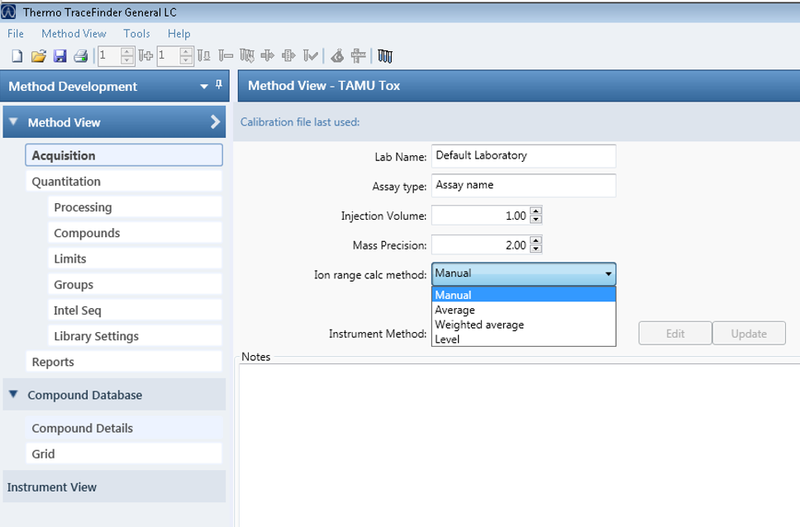 4) Level – This selection allows the user to select a level from the calibration curve as the target ratio reference. In some labs the SOP’s require that a specific calibration point be compared for the batch of samples. The selection of 2-4 are widely used in the applied markets. This relieves the use of having to perform the calculations manually outside of the application and then hand entering the data. Also to note is that if you are working in a batch of samples such as a verification samples set. You may use settings 2-4 to calculate the values then changes the setting to manual. This action keeps the calculated value in the target field. you can then update the Master Method template and use these ratios for all validated batches to follow. Coelution Value – The amount in time that the peak apex of the confirming ion can be different from the quan peak. 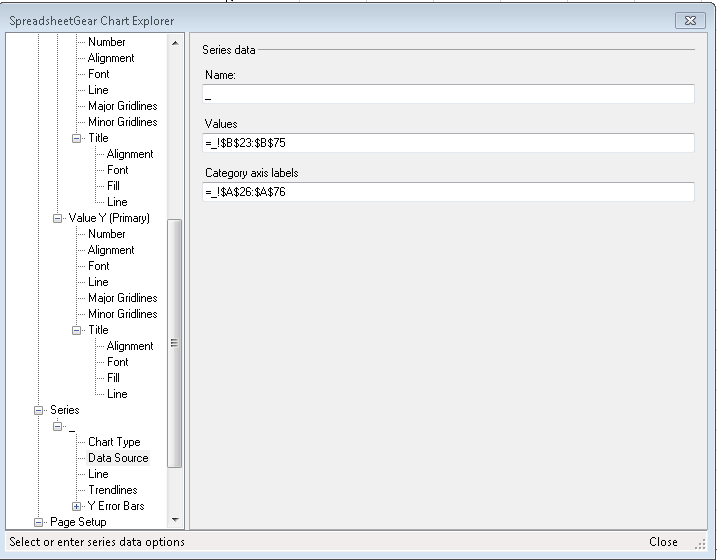 The file hyperlinked below is an example CSV file template for a compound database for TraceFinder 3.3. This file will allow you to record settings from other methods. If you are transferring from one instrument platform to another, this enables you to quickly create the same method in TraceFinder. As a reminder TF can group in the CDB and the Method up to 6 components as individual integrated quantitative peaks under the compound name. This allows the peaks to be viewed and manually manipulated individually in data review but the responses summed as the total response of the compound. Each of the 6 quantitative peaks may have up to 10 confirming peaks with individual ratios and ranges. (A key note is that the Quantitative peaks need NOT be coeluting. (ie.. Chiral compound analysis)) This feature is mostly when using GC EI experiments or LC experiments with multiply charged components.